The question: What the hell do I do with all these chopped almonds? The answer: Almond biscotti! It’s been a good ten years since I last made biscotti and I will never let that much time pass again – these things are awesome. You’ll need everything pictured below. Not bad, right? Yes, that is a bottle of rum you see there. 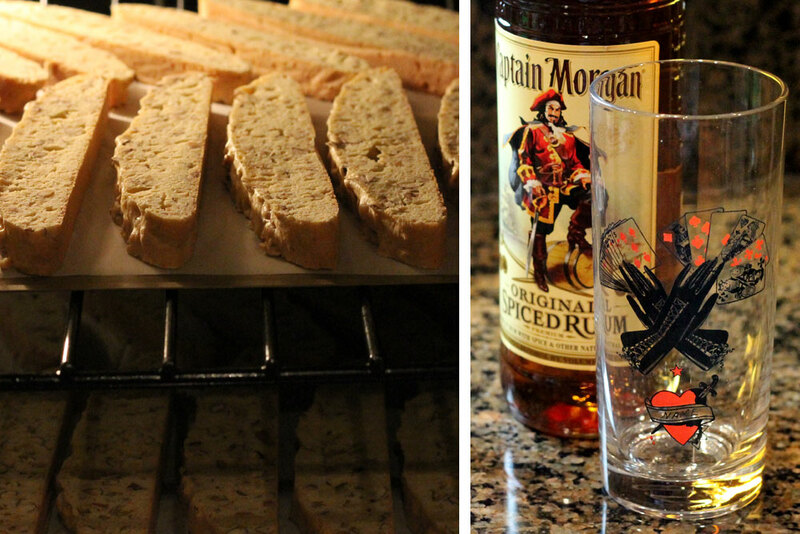 Some rum for the biscotti and some for me. 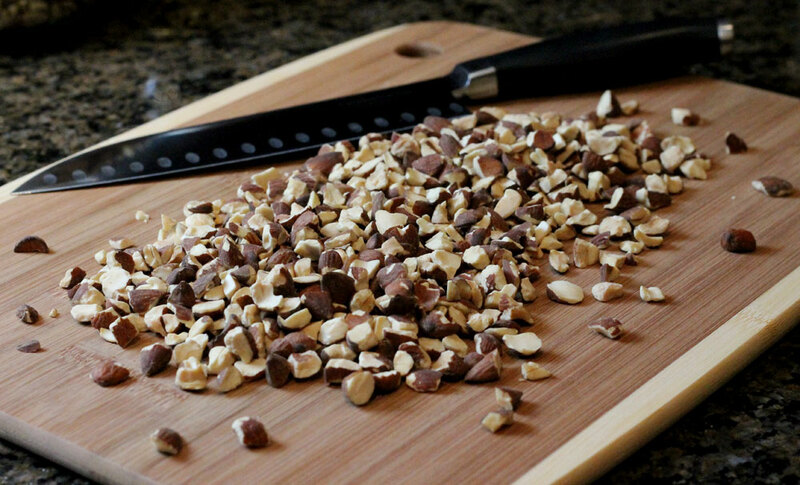 The almonds I had were a bit larger than I wanted (like below), so I just chopped them a teeny bit smaller than this. Once the dough is mixed, it’s scraped out onto a parchment lined cookie sheet, formed into a rectangle-ish shape, and baked for 50 minutes. This will be the first of three trips it makes into the oven. The dough at this stage will be very, very sticky. It isn’t very pretty or tasty looking, and might actually look wrong in many ways, but go with it. It looks much lovelier after it bakes. After baking for 50 minutes, remove it from the oven and let it cool for 10 minutes. 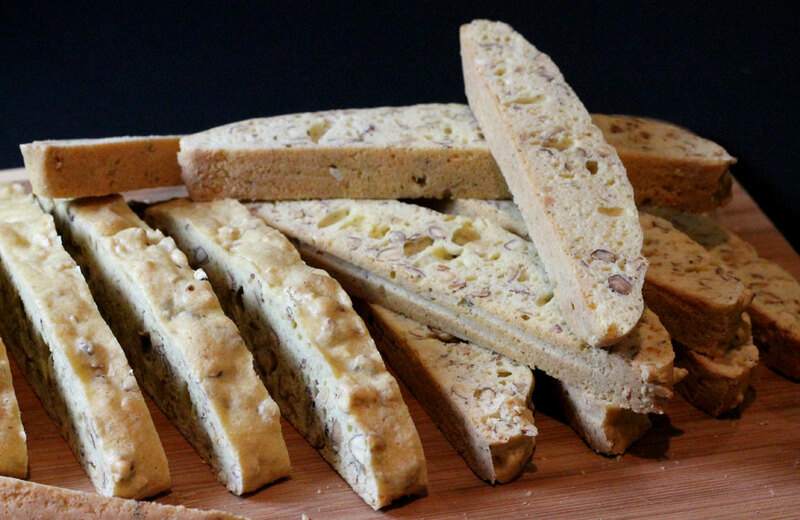 Then, slice it into 1/2 inch slices with a sharp bread knife, which gives you the biscotti shapes everyone knows and loves. The work isn’t quite done yet, though, so sit tight. 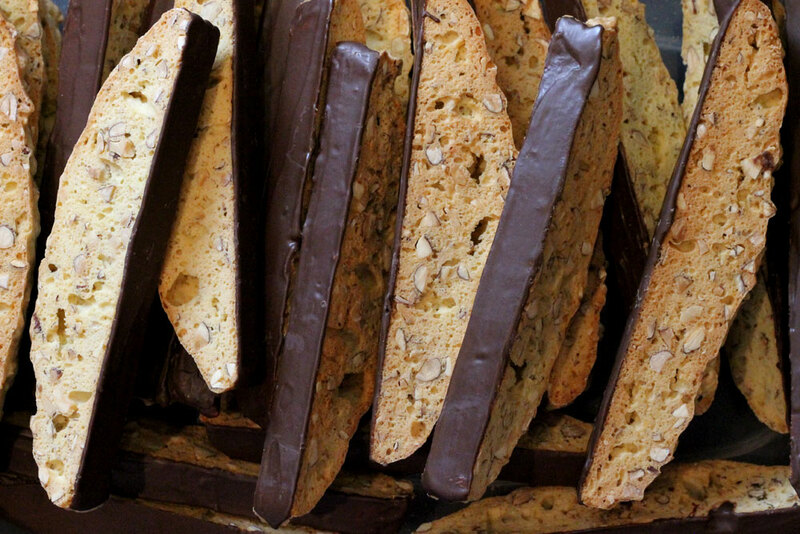 The biscotti are arranged on cookie sheets, cut side down, and baked twice more, 20 minutes on each side. If you still have the rum out, make a drink with the 40 minutes you have to kill. I know I did. Once they’re done and completely cooled, melt some chocolate and either drizzle or spread it onto the biscotti. The chocolate addition is totally optional, but they’re that much tastier with it, so I recommend it. 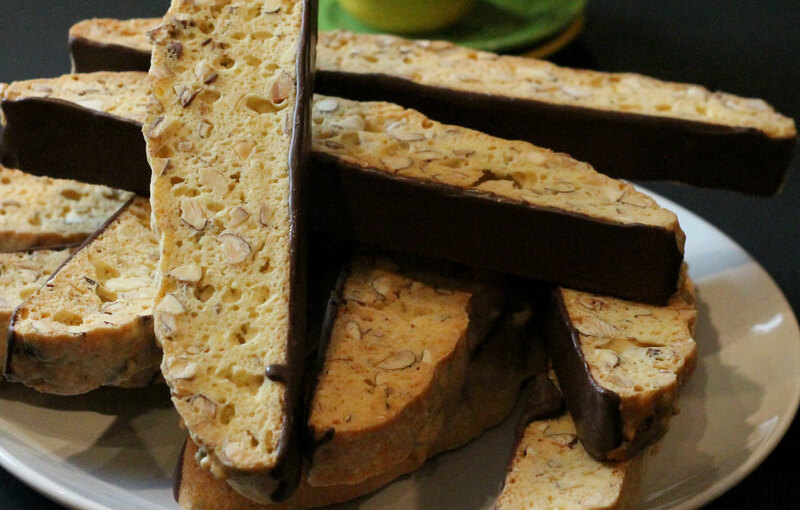 Biscotti are much easier to make than most people might expect. Honestly, most of the time is spent just waiting for them to bake up in the oven (and drinking rum and diet cokes). Let’s also remember how tasty these are and how impressed people will be that they’re homemade. Surj and I each took a dozen to work and they were a total hit. Words like “AMAZING” and “BEST EVER” were used immediately and many times more with each bite! Combine the dry ingredients in a medium sized bowl and set aside. 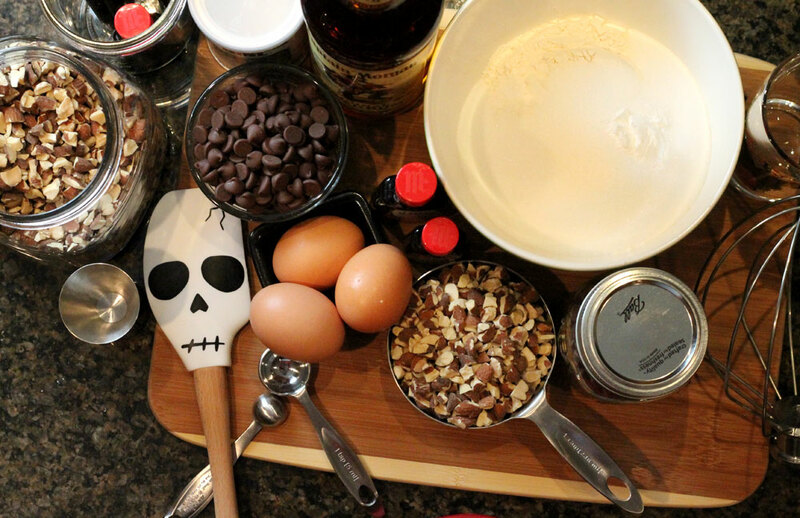 In a separate bowl, beat the eggs, rum, almond extract, and vanilla extract until well blended. Add the dry ingredients to the wet ingredients and mix until combined. Stir in the almonds. The dough should be thick and sticky. Scrape the dough out onto one of the parchment lined baking sheets. 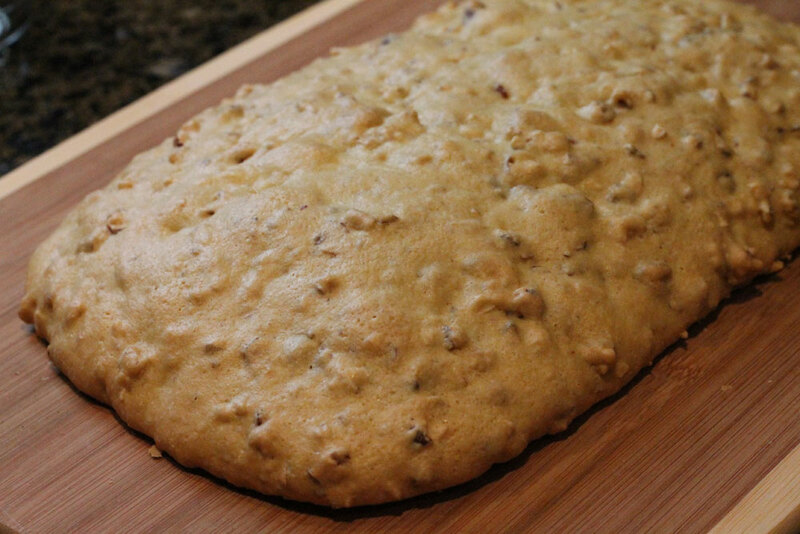 Flour your hands just a bit and shape the dough into a long flat loaf about 10 inches long and 5 inches wide. This will be kind of messy, so don’t worry about how neat it is, just try to get it in that general shape. Bake until firm and dry, about 50 minutes. Remove from the oven and cool for 10 minutes. Then, use a long serrated knife and slice into 1/2-inch wide slices. Lay the slices cut side down on the baking sheet and bake for another 20 minutes. Turn the slices over and bake 20 minutes more, or until the cookies are a light golden brown. 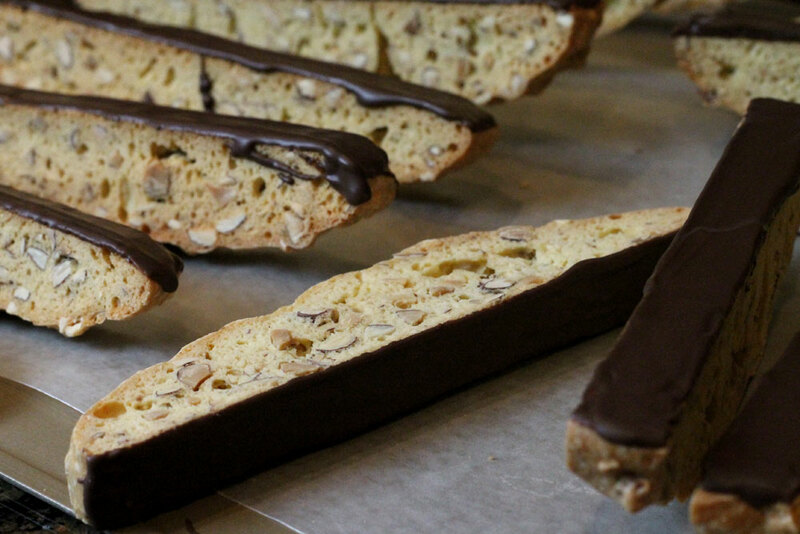 Cool the biscotti completely on a rack and then dip, drizzle or spread with melted chocolate.